Oyeniran, Channon. "Jeremiah Jones". The Canadian Encyclopedia, 19 December 2018, Historica Canada. https://www.thecanadianencyclopedia.ca/en/article/jeremiah-jones. Accessed 20 April 2019. 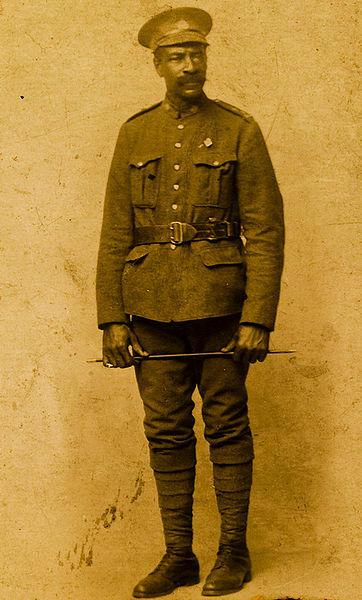 Although Black Canadian men were not altogether welcome in the armed forces, there were those who served in several combat units during the First World War. This includes the 106th Battalion, Nova Scotia Rifles, CEF, which was authorized 8 November 1915. As the 106th Battalion began the recruitment process, protest erupted over the enlistment of Black volunteers. Before an all-Black battalion was authorized in July 1916 (see No. 2 Construction Battalion), approximately 16 Black volunteers were accepted into the 106th Battalion, including Jeremiah Jones. In June 1916, Jones enlisted with the 106th Battalion. Though he was 58 years old at the time, Jones listed his birthdate as 29 March 1877 on his registration papers, which made him 39 years old. At the time, the age limit for recruits was to be between 18 and 45, but over-age soldiers such as Jones — who was 13 years older than the age limit — sometimes lied about their age in order to enlist. Jones was sent overseas and was transferred to the Royal Canadian Regiment in France. Jones fought on the front line during the Battle of Vimy Ridge	in April 1917. During the battle, Jones’s unit was pinned down by German machine gun fire, and Jones volunteered to attack the German gun position. According to Jones’s report, after he reached the machine gun nest, he lobbed a grenade and killed about seven German soldiers. The remaining soldiers surrendered to Jones. Jones made the surrendered German soldiers carry their machine gun back across Canadian lines and drop it at the feet of his commanding officer. Jones was wounded in action at Vimy Ridge, and again during the Battle of Passchendaele (October 1917), and spent a good deal of time in hospital. He was discharged in 1918 in Halifax, after being found medically unfit to continue to serve in the military. Jones spent about two years in the Canadian military and was recommended for a Distinguished Conduct Medal, an award for valour that is second only to the Victoria Cross, for his actions during the Battle of Vimy Ridge (see Medal). Although recommended for the Distinguished Conduct Medal, Jeremiah Jones never lived to receive this medal. As was often the case with Black soldiers, Jones’s contributions to the war went unrecognized. Nova Scotian Senator Calvin Ruck and Jeremiah Jones were friends, and for more than 10 years, Ruck tried to get the Canadian government to recognize and award Jones with the medal, even after Jones passed away on 23 November 1950. In 1986, Calvin Ruck wrote and published Canada's Black Battalion: No. 2 Construction, 1916–1920, a history of the Black veterans of the First World War	(see No. 2 Construction Battalion). In 1993, his campaign for stronger historical recognition of the battalion led to the construction of a commemorative cairn at Pictou, Nova Scotia. During his campaign to have Jones recognized and awarded, Ruck noted that the racial conditions in Nova Scotia and Canada on the whole prevented many Black men who served in the war from being recognized or celebrated for their heroic actions in combat. Despite his many efforts and attempts, Ruck was unsuccessful in getting the Distinguished Conduct Medal awarded posthumously to Jeremiah Jones. On 30 March 1898, Jeremiah Jones married Ethel Edna Geraldine Cook, from Amherst, Nova Scotia. Jeremiah and Ethel were married for 42 years when Ethel died in 1940. The couple had nine children together. Well-known Nova Scotian lawyer and activist Burnley Allan “Rocky” Jones (1941–2013) was one of Jones’s grandchildren. Jeremiah Jones’s grandson Burnley Allan “Rocky” Jones spent much of his life fighting for social justice for Black and Indigenous people in Canada; he had a strong voice in the areas of human rights, race and poverty. As a lawyer, Jones focused his attention in these areas, also advocating for prisoners’ rights. On 9 September 2000, the Last Post Fund established a new gravestone for Jones, with full military honours. The Last Post Fund’s is a nonprofit organization established in 1909. The organization’s mission is to provide a dignified funeral and burial, as well as a military-style gravestone, to any veteran with insufficient funds at time of death. In 2016, descendants of Jeremiah Jones were presented with an honourary plaque by Parks Canada, and Jones’s picture and story were a part of a special exhibit at the Halifax Citadel. On 11 November 2017, Jeremiah Jones’s great-great-grandson, Adam Jones, laid a wreath in honour of Jones at a Remembrance Day ceremony in Ottawa.